There is nothing I love more than celebrating with my Frugal Fashionista friends. Embracing the beauty and style that can come for pennies on the dollar is what my Frugal Fashionista series is all about, and this sweet reader exhibits it all. Her style is very similar to my own, and so it was really fun to live vicariously through her since I would wear every single one of these outfits. You all know how I love black…yes, for some of you boring, but it always look classy especially paired well with great accent pieces. Natalie does this wonderfully. I love the layered hint of hot pink peaking out of her shirt. I love the unusual details in the sleeves. 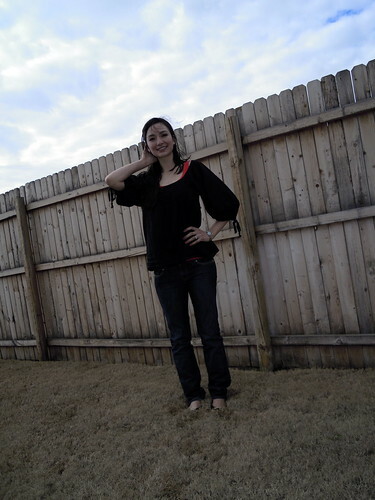 This top can be paired with lots of different colors under it. Everyone needs a soft, cozy sweater! The dark color is a perfect canvas for fun jewelry like this aqua necklace. These are perfect examples of how you can mix and match core wardrobe pieces. 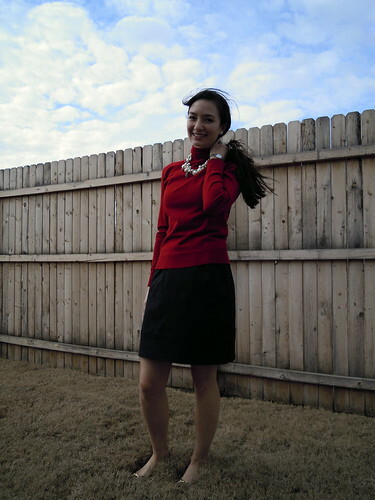 Natalie rocks this $5 Old Navy thrifted black skirt by thinking outside of the box. She completely changes the look by just pulling the skirt up. How fun and sassy is that? If you’ve followed my Frugal Fashionista series for any amount of time, you know I have a fetish for the little black dress. Yes, it’s a sickness, but one I can afford as long as I get rid of some as I buy new ones. 🙂 I do believe that I let out an audible gasp when I saw her in this. FOR $3.50 she could be walking the red carpet with the best of those $10,000 dressed ladies and I mean that. Don’t you agree? Dress: $3.50, Unite Laredoute, thrift store – Showing the sleeves open. The tag is in French. The power of accessorizing is key. I will spend more time in the future posts brainstorming frugal options, but investing in a few great accessories can make or break an outfit. I’ve talked about scarves, but great jewelry is my favorite. 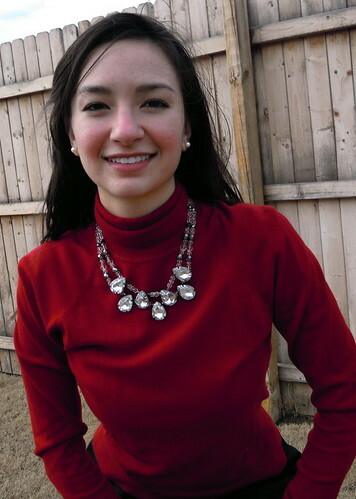 This is a perfect example of how you can take a simple outfit and make it sensational with an awesome necklace. Solid colored shirts and skirts are everywhere at thrift stores. If you want to spice up an outfit, invest in a great necklace. What a find for this vintage style necklace: $0.50 yard sale. Handbags were never a big draw for me until the last few years when I have found amazing purses at yard sales. Now I love to pack a punch with a great purse. It’s definitely another wonderful accessory item. Bag: $5, no tag, thrift store. This bag is made of metal links. She cut off the long braided leather handles that it had and attached these wooden ones instead. $2, Austin Clothing Co., thrift store. Instant outfit – the $2 bag pops up again. 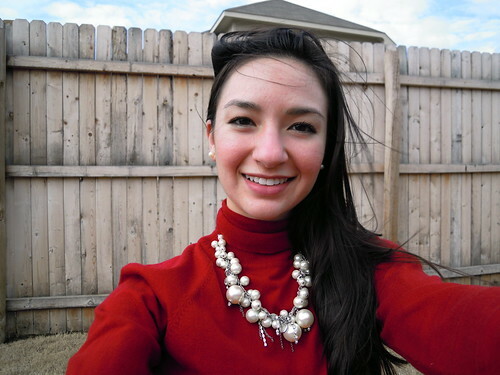 I hope you all had as much fun as I did with Natalie’s Frugal Fashionista finds. She definitely ROCKS this title, and has inspired me to take a little extra time with my photos. I just love how she took the time to actually make a photo shoot out of it. Thanks for supporting our Frugal Fashionistas. 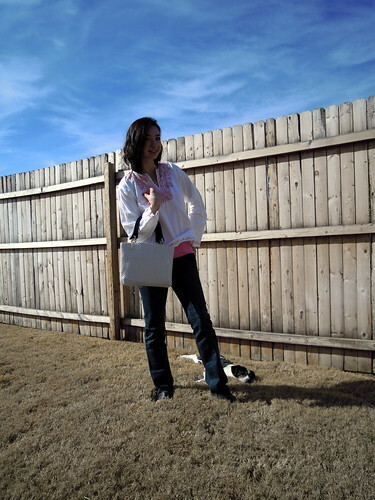 What an awesome “frugal fashionista fashion shoot”!! Loved seeing all of the beautiful outfits she found & her style is great! This was really fun, thanks for sharing with us. Inspiration for sure! Oh my word! Natalie is gorgeous! I think she could be wearing a paper sack and look amazing, but her thrift store finds are awesome! Please let her know I have room in my basement if she ever needs a home. I would LOVE to have her take me thrift store shopping! Wow! You found some really good items. 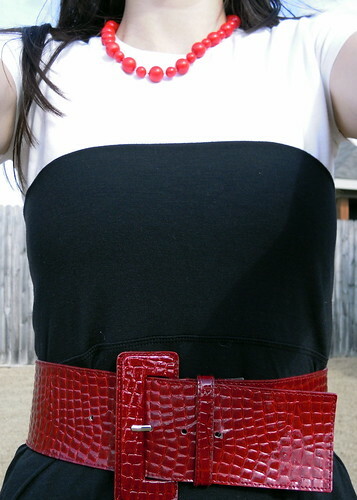 I love the way you added interest and color by adding necklaces and a belt. I agree with Toni, you can take me thrift store shopping anytime. Great ideas! I love all the looks you created. Thanks! Natalie! Those outfits are truly incredible, and that black dress REALLY took my breath away!! Wanna take me shopping?!?! 😉 Have a great weekend! Natalie looks so darling!! I wish I was that tiny!! Keep these great posts coming!! Very cute – love all the items she found too!! Especially that black dress! I’m keeping an album on FB updated with thrift store finds and it’s really fun to keep track of all the purchases in one spot! Wow! I absolutely love this post! Those pics are so inspiring! 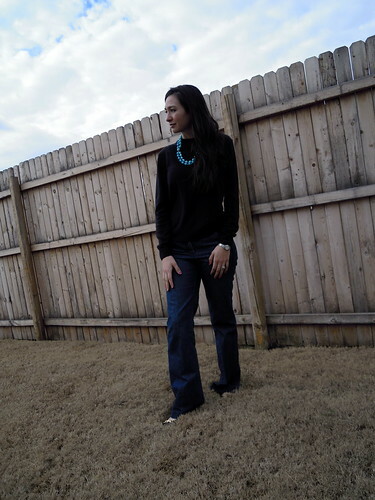 I recently started really hitting the thrift stores since finding this blog ( I love the Frugal Fashionista series). And have found some really good deals using your techniques (unique sleeves and the touch test). This could become an obsession, lol! These outfits rocks.. Good Job Natalie..
thanks, ladies! My sister told me I looked like either Elvira or Morticia Adams in that black dress, but I like it! I found a fabulous dress from the 60s or 70s with embroidery in silver thread; I’ll have to post pictures of it. keep thrifting! I love these fashion ideas, especially the skirt one. My sis and niece have done something similar. I would love to see if I could get a pic and share that one with you. I also love that y’all seem to find so many thrift stores that I wasn’t aware of, especially in the brand name dept. And… She rocks that black dress!! More, more, more! I love your Frugal Fashionista posts! I am new to your blog but I have been following you through Censational Girl.Thanks for the insightfull posts you bless us with.I enjoy ALL of them.It’s 3 pm in Allentown PA ,sun is out and I’m going to bless my kids with your “Homemade Cinnamon Rolls”.Blessings to you & your wonderful family. You guys look amazing!!! Love the deals! !